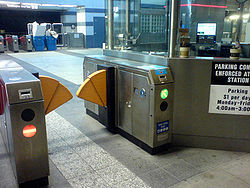 BART faregates accept BART tickets, Muni Adult Fastpass (SF stations only), Clipper cards. 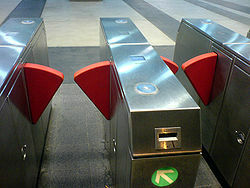 Insert BART tickets or Muni pass into the front slot to the right and pick up the ticket on top of the faregate (pick up at the front slot for wide wheelchair accessible gates). Clipper users can just tap the card on the blue Clipper logo on top of the faregates (for wide gates the blue reader is located on the side). 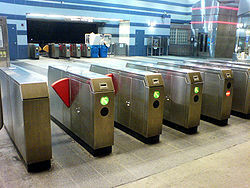 Wide fare gates for riders in wheelchair or with luggage. Clipper reader is located on the side wall. Clipper reader is located on top of the fare gate. This page was last edited on 18 February 2011, at 04:24.